Immigrant voices in archival records: The Cumbrian Connection, final post. Note: As we conclude our project comparing Peel and Cumbrian records, the County of Cumbria is currently suffering the aftermath of devastating floods which have tragically affected many of its residents. We offer our concern and best wishes to the people of this beautiful region of England. Readers who would like to support recovery efforts can find out how to do so via the Cumbria County Council. In this series of blog posts we’ve been exploring how a comparison of two archives in two different countries can inform us about archives in general, and about the people whose stories they save. In a way, archives are all about specificity; the unique records they preserve are tied to particular people at particular times. Yet for this very reason, archives uphold a universal value: the existence of archives declares that human lives matter and deserve to be documented and remembered. The particular stories we’ll be exploring in this post are stories of immigration which, again, is a universal human experience. Although we’ll be looking at immigration from one area of England (Cumbria) to one area of Canada (Peel) at a particular time (the nineteenth century), the story of immigration itself never ends. In a sense history is the story of the movement of peoples, and it is archives that document how that movement changes people and communities. Historical records help us to appreciate how immigrants have shaped who we are, just as they will shape who we’ll become. In this post we’ll meet two places called Brampton – a town, and a city – and three nineteenth century people who travelled a world away to bridge the two. These people represent many thousands more of whom no traces remain. We’ll begin with a brief look at the places our three immigrants came from and travelled to. 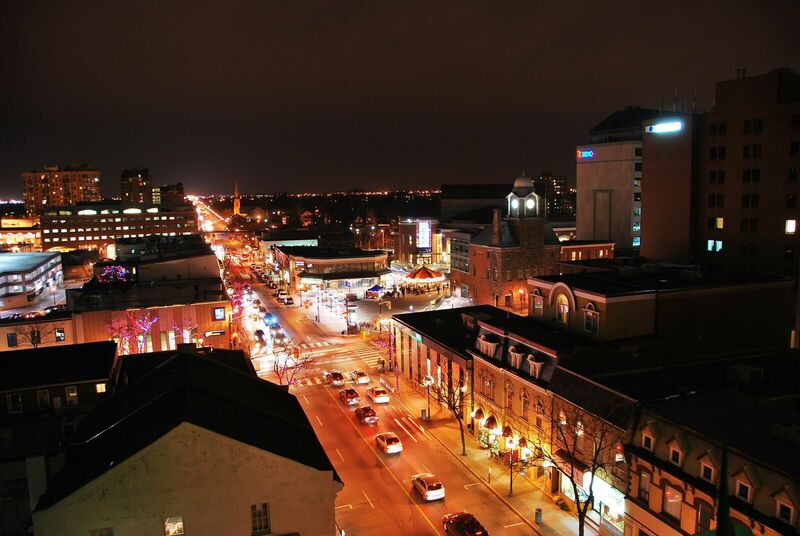 With its almost half-a-million residents, today’s City of Brampton is the ninth largest city in Canada and is one constituent of the Region of Peel, the second largest municipality in Ontario after Toronto. The story of Brampton is one of dramatic growth based in large part on immigration. Today the city occupies a vast area of residential subdivisions, parks, and industrial developments with a heritage downtown core. It is now hard to believe that 200 years ago the area was covered by dense forest and swamps inhabited by wolves, beavers, and bears. Brampton began, as did so many early settlements, at a crossroads near a river: Hurontario Street (called Main Street in Brampton) and Queen Street were significant surveyor’s “lines” near the Etobicoke Creek. The first building in the area is thought to have been Thomas Buffy’s tavern, and Brampton was initially known as Buffy’s Corners. The settlement quickly filled with people from England, Scotland, Ireland, America, and other parts of Canada. It was named “Brampton” thanks to settlers from England (see below). The main occupation of its early settlers was farming: Chinguacousy Township, in which it was situated, was divided into large farm lots which had to be individually cleared of trees. Initial businesses and fairs in the settlement were centred on agriculture but in the later nineteenth century large-scale industry introduced factories and manufacturing. The most renowned of these businesses was the Dale Estate, one of the world’s largest greenhouse businesses and international suppliers of flowers like roses and orchids. Brampton still bears the moniker of “Flowertown” and its many garden parks commemorate a business that once employed a quarter of the town. 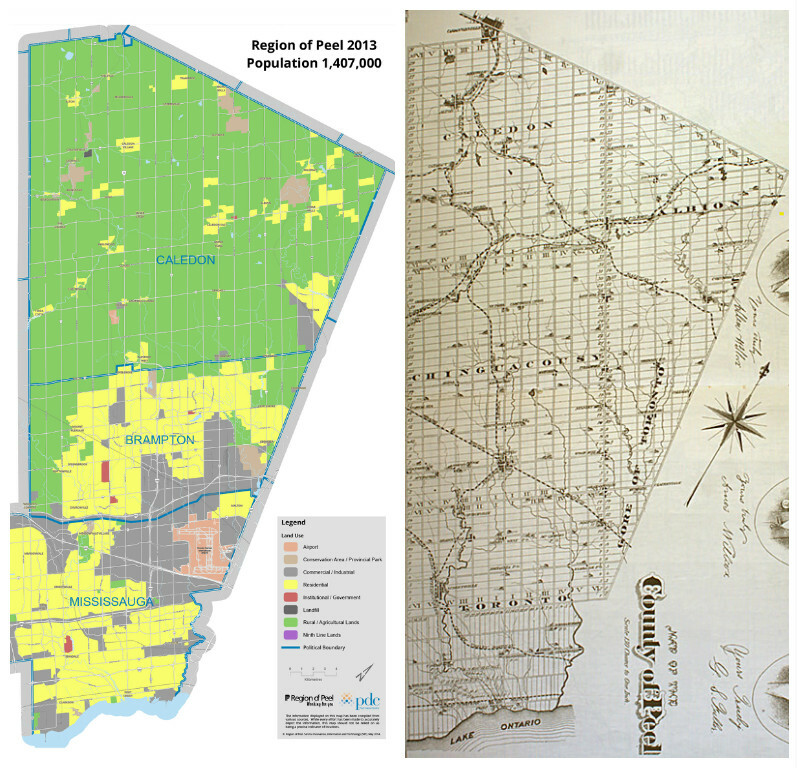 Maps of the Region of Peel (2013) and the County of Peel (1877) showing the relative size of Brampton. 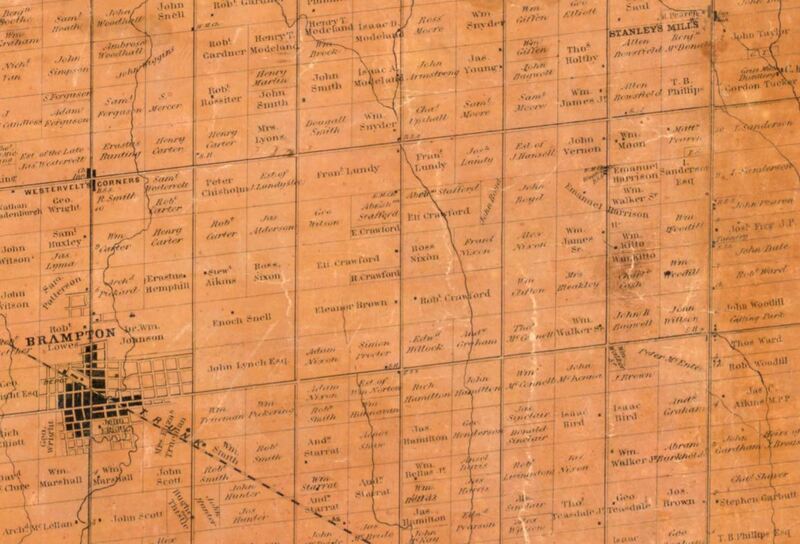 In 1877 Brampton is the town about two thirds of the way down the map along the railroad. 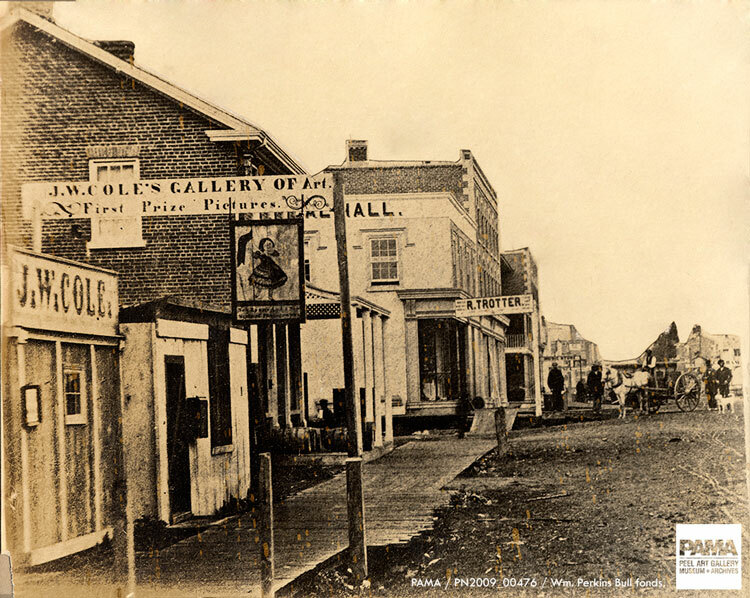 Brampton became a village in 1853, a town in 1873, and was made the seat of the County of Peel in 1867 thanks in part to the building of the railroad through town. The population at the beginning of the twentieth century was only about 3000, but climbed steadily. 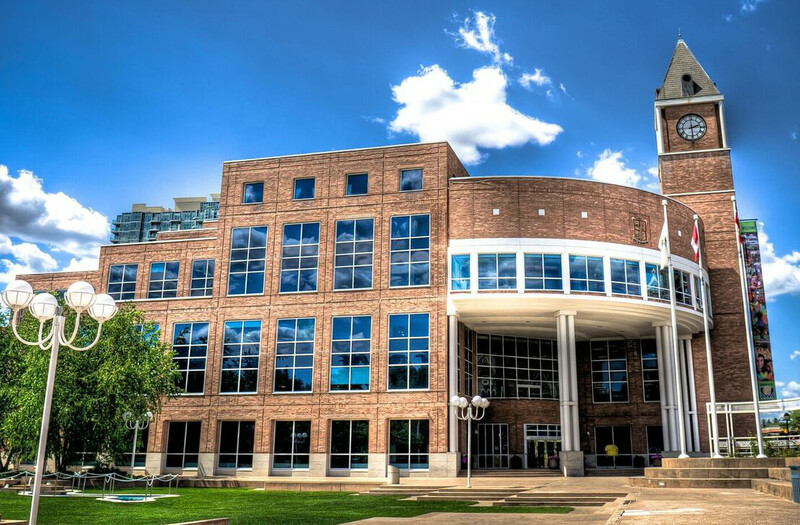 It began to boom after the Second World War and reached new heights after 1974 when the City of Brampton was created within the Region of Peel and encompassed most of the entire township, together with the other settlements within it. Today Brampton is particularly known for its multicultural populace, with half of residents speaking a non-English first language. Many of Canada’s Bramptonians probably don’t realize that their city was in part founded by Cumbrian immigrants from another Brampton in England. Many of these settlers brought with them little but their own hopes for the future and their memories of home, commemorated with the name of Brampton. Place names are one way that immigrants from the past speak to the future. The market town of Brampton in the north of the present-day Cumbria is about three miles from Hadrian’s Wall, the Roman ruin that traces the border between Scotland and England. It is surrounded by hill farms and conservation areas and built from the red sandstone of the area. In 2015 Brampton is still not much larger in population (about 4500) or in size than it was in the nineteenth century. Its history goes back much earlier. It is mentioned in records as early as the early 1100s. Theories about the ancient origins of the name “Brampton” are that it refers to the “tun,” or farmstead, in a brambly (thorny) place; or that it is a corruption of “burhampton,” that is, “burh,” or fortress, on a hill. The designation of market town is an official medieval title which allowed towns spaced a certain distance apart to hold agricultural markets which were the main arenas for commerce in goods and in labour. Brampton got its town status in 1252, and has all the colourful and rich history you would expect for a medieval town in a border area. Today the area attracts many tourists and outdoor enthusiasts. The basic shape of the town has also not changed much over hundreds of years. The core is made of two streets which meet at one end. They are plainly named: Front Street and Back Street, with the market area at one end of Front Street. Many of its most characteristic elements would have been familiar to the inhabitants who would leave it for Canada, including the 1817 Moot Hall (now the Visitor Centre) and the Old Church. 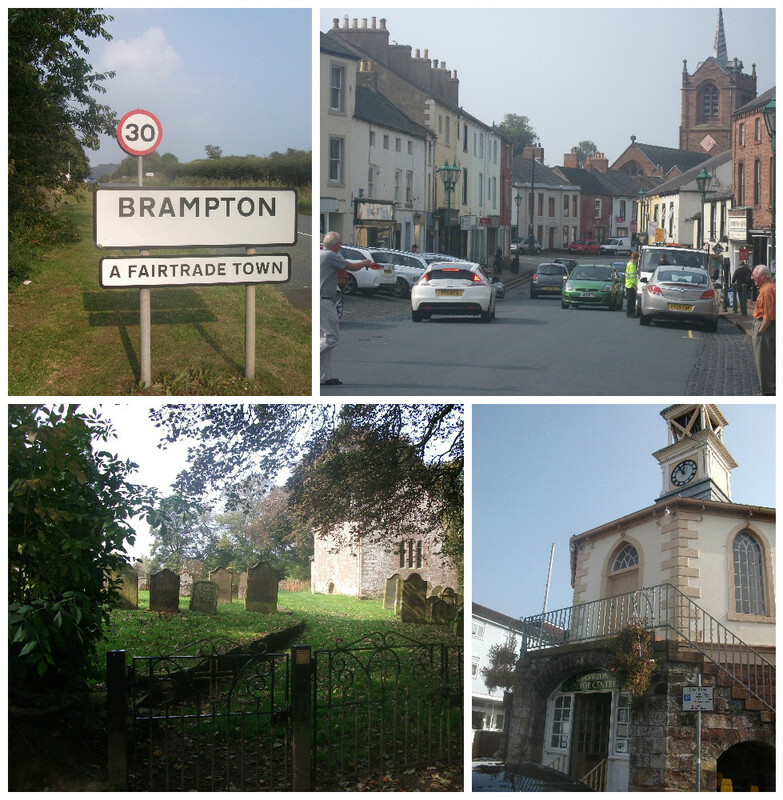 In the nineteenth century, Brampton was in the old county of Cumberland (in 1974 Cumberland was combined with neighbouring counties to make up Cumbria). Some of the inhabitants of Brampton were agricultural workers, but many also worked in the coal mines of the area, as well as brick- or lime-works. Townsfolk also included blacksmiths, chemists, watchmakers, builders, tanners, tailors, butchers, carpenters, and many other tradespeople. Why would nineteenth century Cumbrians leave everything familiar for a long and risky sea voyage to a young country? Lucille Campey is a historian who studies early British immigration to Canada. She believes that Canada’s English immigrants are those we think we know best, but really know the least. The stories of elite governors and wealthy land speculators have overshadowed the legions of more humble English immigrants who were simply seeking a better life. Most of Ontario’s English immigrants came because in England they were poor, landless, or under-employed. The early to mid-nineteenth century was a grim period for the average labourer. It began with the “enclosure” of formerly common grazing land by the wealthy, got worse with the post-Napoleonic depression, and was exacerbated by the increasing mechanization of agricultural labour. 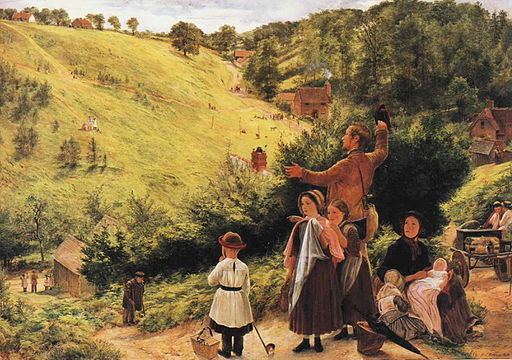 Between 1830 and 1870, nearly a third of Britain’s population lived in relative poverty. In rural areas, three-fifths of the countryside was concentrated in the hands of wealthy landowners. In the mid-century less than one-fifth of England’s 300,000 farmers actually owned the land they worked. 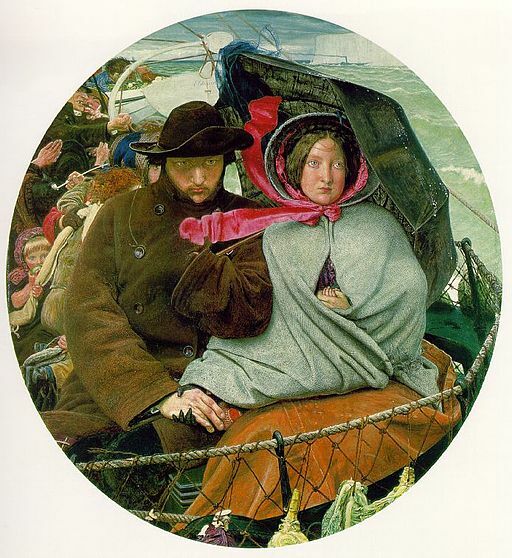 The Last of England by Ford Madox Brown, 1855. Birmingham Museum and Art Gallery. By comparison, Canada offered cheap (and sometimes free) land to those willing to develop and maintain it, low taxes, and – due to a labour shortage – high wages. The price of settlement was an expensive (in effect, one-way) protracted trip across the ocean, perhaps permanent separation from family and friends left behind, back-breaking work, and of course, uncertainty. Immigration to Upper Canada began with the Northern English, especially those from the present-day counties of Yorkshire, Northumberland, and Cumbria. Historians surmise that tough northerners were less easily put off by the harshness of Canadian winters and the rigours of carving farms out of the wilderness. Next we’ll meet some ordinary Cumbrians who took that enormous leap of faith and helped to build Brampton in Canada. We know a great deal about William Lawson’s early life in Cumberland because shortly before he died he began an autobiography which his grandson self-published. Unfortunately Lawson could not continue his narrative past his arrival in York (Toronto), but his grandson tells us more about his achievements in Canada. 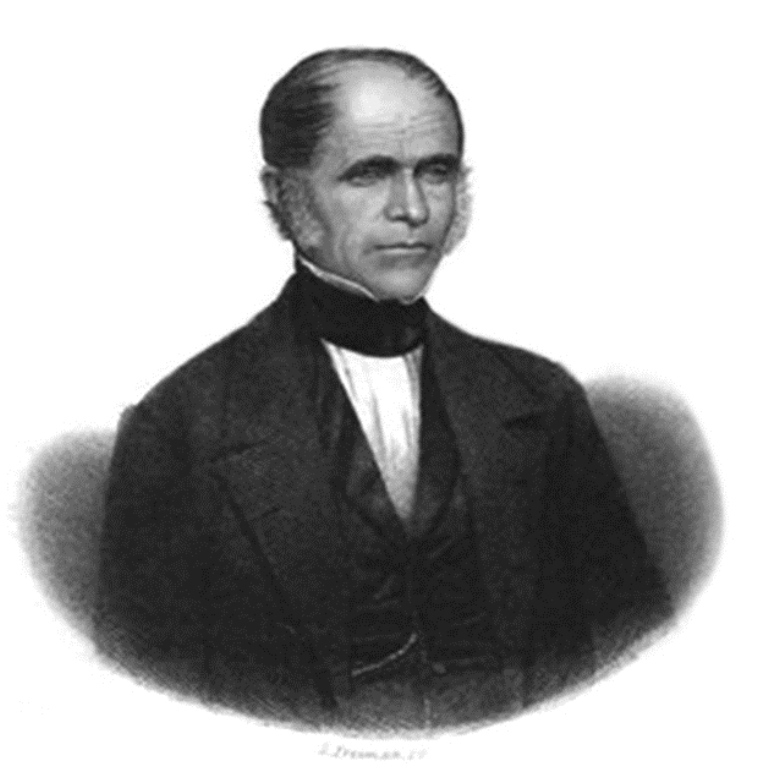 William Lawson as depicted in the Primitive Methodist Magazine, 1853. Lawson emphasizes his respectable but humble family origins in Wallholme in the Parish of Lanercost, Cumberland, where he was born in 1793. His father was a tailor while his mother was the daughter of a “laird” who was, he significantly points out, “the owner of the land he cultivated.” The land did not fall to Lawson’s branch of the family, so at 13 he himself was working as a tailor. He was an earnest youth, given to wandering by streams while composing poetry. A strong spiritual bent attracted him early on to the street preaching of the Methodists. Methodism was a reaction to the pro-forma, clericalist, and elite associations of the established church. It began as a personal expression of religion supposed to be closer to the experience of the early Christian church. 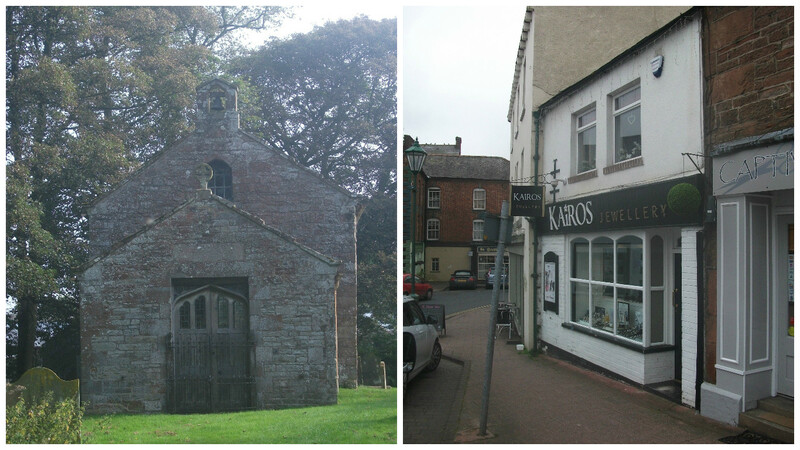 Lawson himself much admired his own wife, who was a capable small-business woman when he married her in 1814 at the Old Parish Church in Brampton, Cumberland. The couple moved to the town after their marriage where they added his drapery trade to her straw-bonnet business. While trying to make ends meet for a growing family, Lawson preached throughout the area in the streets and in homes, trying to bring people to the same kind of conversion experience he felt had given him peace. 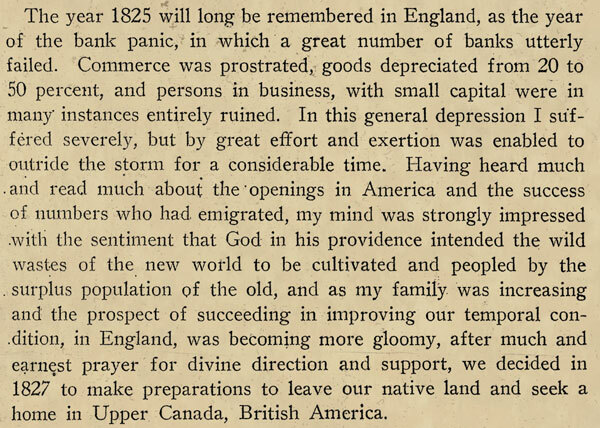 It took Lawson and his family two years to overcome numerous obstacles to emigration, one of which was the cost. Eventually they were able to borrow the 45 pounds – an exorbitant sum at the time—for their passage to Canada. Lawson kept a day-by-day journal of the month-long journey from England to Quebec. The greatest hardship occurred on the large family’s river trip from Montreal to York (now Toronto). It was nearly impossible to find food, and on the cramped vessel travellers were forced to stand up for days on end. Things improved quickly for the Lawsons, however, after their arrival in York. After building and then selling a business in York, Lawson bought land in Peel in 1834 where he started farming and opened a general store at a crossroads which was to become the core of Brampton, Ontario, which he reportedly helped name. Lawson was to leave Brampton in 1847 for Hamilton where he was an active orator in political and religious circles as well as a Justice of the Peace. His Methodism expressed itself in his opposition to class privilege in his new country. As of 1917 there was in the Primitive Methodist Church back in Brampton, Cumberland, a plaque commemorating Lawson who “introduced Primitive Methodist into Canada and founded the town of Brampton, Canada.” He died in 1875. Like William Lawson, John Elliott was a Primitive Methodist and is also credited as naming Brampton in Ontario after Brampton in his homeland of Cumberland. Local Brampton lore holds that Lawson and Elliott were acquaintances and named the fledgling settlement together; however, there is no recorded evidence of this relationship. We don’t know anything about Elliott’s experiences before his immigration to Canada and, unless his descendants come forward with letters or journals, we know nothing of his inner life. We do know that he prospered in Brampton, Peel County. Elliott was born in 1794 in Bewcastle, a parish a few miles away from Brampton in Cumberland. Records show that he arrived in New Brunswick in Canada in 1817 with his wife, Mary Jane, and five children. Although he petitioned the Crown for 200 acres of land, it is unclear whether he ever received it in New Brunswick. 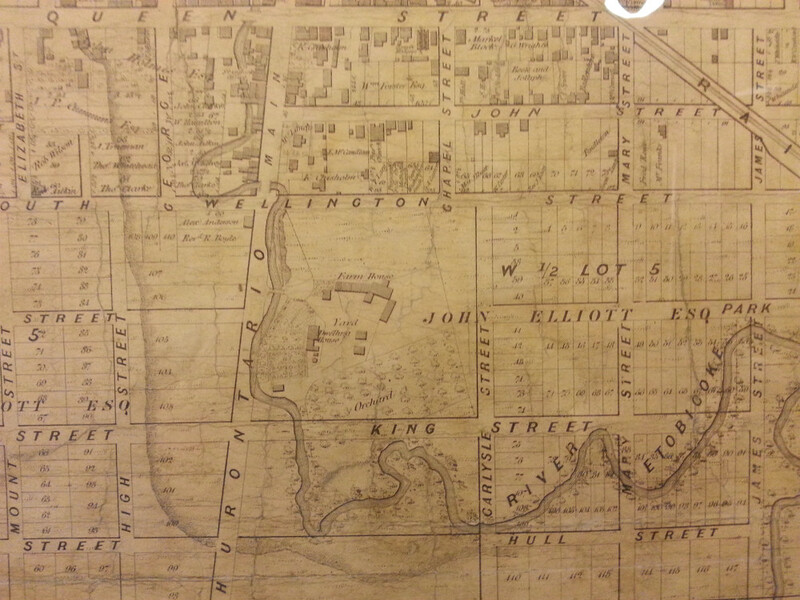 Instead, the Elliotts moved on to Peel County around 1821 where they settled in what is now Brampton. Elliott developed a number of farms in the area, many of which he seems to have rented out. Elliott’s contributions to the county included acting as postmaster, pound-keeper, Director of the County Society for Agriculture, Director of the Board of Agriculture for Upper Canada and petit-juror. The township lot with which history most associates Elliott is Concession 1, Lot 5. This was where his own substantial farm was located and where he laid out smaller village lots to form what is now the core of downtown Brampton. PAMA (the Peel Art Gallery, Museum and Archives) has a special connection with John Elliott: he donated the land for Peel’s county buildings – including a courthouse, registry office, and jail – which PAMA now occupies. John Elliott died in 1871. His will gives us an idea of the life he was able to make for himself and his family: it details an inventory of worldly goods – including $11,000 in cash—which would have been an unlikely achievement back in England for someone of his class. He is buried in Brampton’s Old Cemetery (popularly known as the “Pioneer Cemetery”). This later Cumbrian immigrant to Peel County with a rather Dickensian name has only recently found a voice again thanks to an 1857 letter carefully preserved letter at the Cumbria Archives Service. Prior to my visit there, I was searching their online catalogue for material sent back home by immigrants to Peel County; I came across a reference to the letter, which staff kindly retrieved for me. The letter indicates that he hailed from Nenthead, Cumberland, an industrial village built for servicing the lead and silver mines in the area. Passenger records show that at the age of 16, Vipond came to Canada via the US, travelling on the ship City of Glasgow from Liverpool to Philadelphia in 1853 with his mother, uncles, and siblings. The letter itself was sent from the Stanley’s Mills post office in Peel County to Nenthead, Alston, Cumberland. It took over two weeks to reach its destination. Vipond writes that he is “living 6 miles from Brampton [in Peel]” and relates news of his mother, sister Elizabeth, and “father” (in fact his stepfather). A Brampton post office address for his father, Richard Elliott, is provided at the end of his letter. 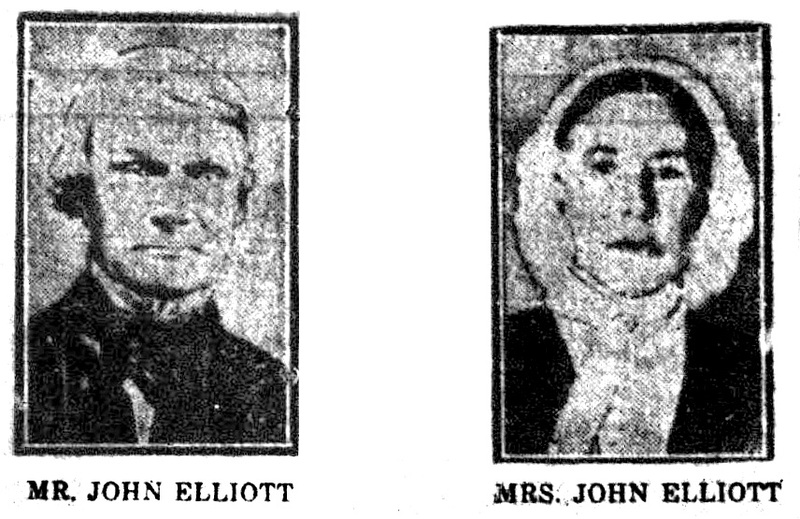 From this and other clues we learn that his stepfather – his mother’s new husband – was none other than John Elliott’s son. Evidently, Cumbrian immigrants formed a tight-knit community. Peel post office addresses provided by Vipond for his stepfather, Richard Elliott, and himself (top). 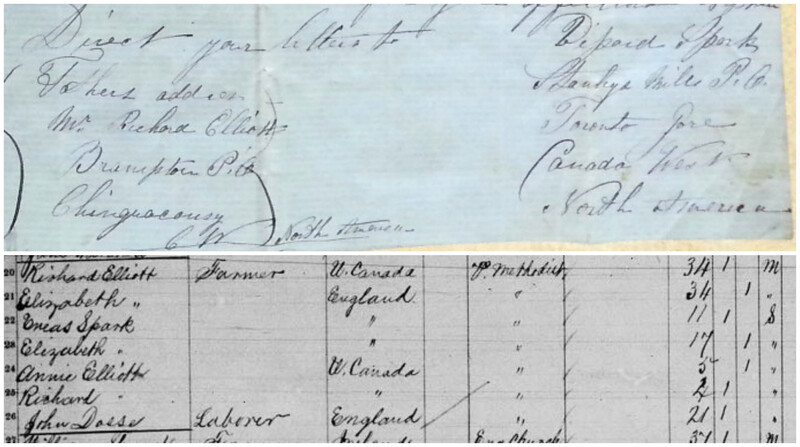 Canadian census entries for 1861 showing Vipond’s mother and sister living with Richard Elliott, John Elliott’s son (bottom). I can say that there is a great deale more wickedness in this country then there is in the pleasant villages of Nenthead and horrible jelousey is very common in this Country, which makes people live like distant neighbours…this country is far behind the Old Country in a great many things but tell a Canadian that and he will tell you he never seen any of the smart men and great things you speak of, yet if there is like to be any disturbance between this Country and any other, they will say, “England will send men to protect Canada.” They do not depend on there own strength, but depend on people which they thinck are there superior’s. If you can work you will get good wages, good vittels and plenty to eate. We see very few Beggars…Dear Uncle, we like this Country very well but not the ways of some of the people. I would not come back to work in the mines but I shall ever love the land of my Birth. It seems that Vipond’s bid to escape the drudgery of the Nenthead mines was successful. Canadian archival records, including the national census and a directory for Peel County, show that he ultimately set himself up as a blacksmith. It’s worth thinking about how much less we would know about our shared past without the archival records used to piece together the stories above. They tell us that immigrants bring something of their background with them and make something new. Immigration to Peel continues, not so much from Britain but from many other places in the world. Archivists, as well as the donors of archival material and the researchers who consult it, will ensure that the stories of immigrants will continue to inform our self-understanding. Their work is essential to documenting the human story as people move from one area of the world to another. Migration means that archives need to be everywhere, for all our sakes. Archives are not isolated – as we hope this blog series has showed – because our histories are intertwined. It has been a moving experience for us as archivists to compare records from our two archives, the Peel Archives at PAMA, and the Cumbria Archive Service. We hope that, like us, our users and readers have learned something about one another’s homeland through the unique window of archival records. Thank you to the Cumbria Archive Service for their participation in this experiment by providing special access to their records. Thank you also to genealogist Ann Ward for her work on fleshing out the stories of John Elliott and Vipond Spark using our and other archival records. Campey, Lucille H.. Ignored but not Forgotten: Canada’s English Immigrants. Toronto: Dundurn Press, 2014. Campey, Lucille H.. Seeking a Better Future: The English Pioneers of Ontario and Quebec. Dundurn Press, 2012. Gagan, David. Hopeful Travellers: Families, Land, and Social Change in Mid-Victorian Peel County, Canada West. Toronto: University of Toronto Press, 1981. Lawson, William. The Life of William Lawson, J. P., One of the Builders of Canada: Written by Himself With an Introduction and Notes by a Grandson. [Hamilton, Ont.? ]: Privately printed, 1917. Penn, Rev. D. Brampton & District: Official Guide. Brampton, Cumberland: Border Publicity, 1971. Town of Brampton. Brampton’s 100th Anniversary as an Incorporated Town 1873 – 1973. Brampton, Ont. : Printed by Charters Publishing Company, 1973.